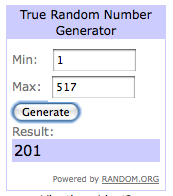 mon petit lyons: Giveaway Day Winner! Thanks to all of you for the amazing response on my Sew, Mama, Sew Giveaway Day! I asked you all what to do with the Mermaid fabric I was keeping and what you would do with yours. I saw lots of ideas for various bags, skirts, sundresses, cover-ups, pillows, shower curtain, duvet covers, quilt backs, whole cloth quilts and even one response to use it for faux taxidermy (if only I had such talents!). I'm still not sure what to use mine for, but I am leaning towards using some of it for a whole cloth quilt and some of it to cut up for various little projects. Out of 517 comments, 201 was the winner. I hope she enjoys the skirt and you have some left over to make some more fun stuff! Since I hate to post without a picture, I'm including this. Shot in the poorly lit living room at night. Jack attended a Polar Express Party tonight at Small Hands, Big Art - an amazing company in town that offers art classes and camps. They wore pajamas, drank hot chocolate, ate cookies, got their "tickets" punched and made some wonderful things, this cardboard gingerbread house included. I love how they always use really cool materials and get the kids super excited about creating. So thanks again for playing along, and if you're a new follower, please be patient. It's rough to blog amidst the holiday craziness, but I'll be running more smoothly in the new year (I hope!). Have a great weekend! Hahaha, that is a great gingerbread house. Kids do such fun things.